Providing electric circuits to bathrooms are like kitchens but unlike bedrooms. Bathrooms are damp so wiring must be GFCI-protected and exhaust fans must be provided. Bathrooms are unique in the home when it comes to electrical service. By nature, bathrooms are damp environments and water and electricity make poor bedfellows. The previous article examined wiring a kitchen; the next one discusses powering a laundry room or workshop. This one discusses how to wire a bathroom. Like all home electrical work, its important to consult with the local building code before beginning to wire a home bathroom. Local building codes vary by area but some things are common. It's safe to say that they all require using Romex or nonmetallic (NM) cable. If your code requires a licensed electrical contractor, you cant go wrong checking Angies List. to locate one. For instance, it is generally a requirement that the electrical receptacles be on one circuit and the exhaust fan and the light fixtures be on another. As with other rooms, install the light switch so that it is approximately chest high close to the door. Although in some areas its permitted to allow bathroom lights and receptacles to share a circuit with other rooms, its not always a good idea. Also, most building codes require that all bathroom wiring be GFCI-protected. If hot water is provided by a tankless water heater, the building code may require it to be on its own circuit. Its always a good idea to install a bathroom vent fan. Although there may still be some local building codes dont require one, its always a good idea to get rid of the moisture and vent it to the exterior of the home. Too much moisture promotes mold and mildew, its uncomfortable in the winter months, and bathrooms can have their own peculiar odors. Installing and wiring up a bathroom vent fan is similar to installing a ceiling fan, except for the weight factor. In many cases the fan is wired to the same on/off switch as the light but not always. If the local building code doesnt address it, then it is up to the architect or homeowner. Every now and then, the vent fan and the light are incorporated into one unit. Bathrooms should be well lit, so its important to plan for at least two sources of light; general lighting which may be a recessed canister fixture or a surface mounted fixture, and functional lighting at the bathroom sink/mirror, usually called a bath vanity for obvious reasons. The general light may be provided by a low-voltage halogen bulb or a LED spotlight. Either of these will provide energy savings. The functional lighting is usually a strip lighting fixture directly over the sink/mirror but some homeowners prefer to place a sconce on either side of the mirror. In the end, its simply a matter of decorating choice. Some baths include a recessed can light with a waterproof lens cover in the shower area, but in most cases this is not needed. 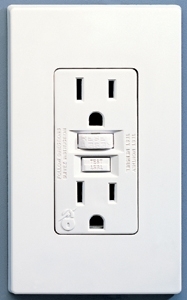 Plan on installing at least one receptacle on the wall next to the sink. It must be a 20-amp GFCI receptacle and should be positioned so that the cord of a hair dryer or similar appliance doesnt drape over the sink. Again, electricity and water arent very good friends! In most cases, bathrooms are not big enough to require any more electrical receptacles. In no case should one be installed below the level of the sink. Remember that the bathroom should be an inviting and well-lit room. Designing the bathroom and planning the wiring with this in mind will result in success!